The bustle of the holiday season leaves many of our wallets parched and dry, making little means for fun activities during the start of the new year. However, this year’s winter fun doesn’t have to stop after the holidays. Morro Bay, the California seaside fishing village, extends a warm (and salty) hand to those looking to vacation on a budget this January and February. 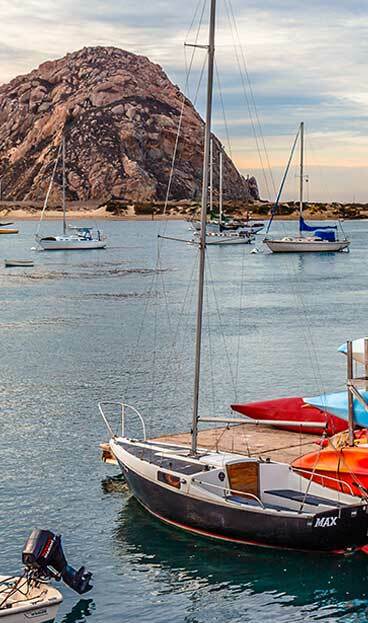 Named #4 by Budget Travel in “10 Best Bargain Trips for 2018,” Morro Bay turns a summer beach day into a year-round lifestyle, honing in on budget-friendly ways to play in the bay. With daily warm temperatures, miles of uncombed beaches and the calm waters of the bay, a variety of water activities are within arm’s reach. Whether you’re into relaxing in the warm sand or embarking on a kayak adventure, there’s a piece of Morro Bay for everyone to enjoy. Winter is the time to be outside with many migratory species visiting town. Bring your binoculars for an opportunity to see monarch butterflies and more than 200 diverse species of birds. Take a walk around the State Park to stumble across an abundance of wildlife you likely won’t see anywhere else. To learn more about these unique animals, come take part in the Winter Bird Festival, January 12-15. Click HERE to learn more. January and February are special months for visitors, with town-wide deals on all the best hotels and restaurants. Every hotel guest in January and February receives a free RESTAURANT PASSPORT to savings at some of our favorite places to eat, offering FREE homemade pastries, fresh salads, wine tastings, desserts, seafood appetizers, clam chowder and MORE! Marina Street Inn Bed and Breakfast: Stay 2 consecutive nights at the Marina Street Inn Bed & Breakfast (at the regular rate) and get the 3rd consecutive night 50% OFF. Delight with a gourmet breakfast each morning and wine reception in the afternoon at the only all-suite bed & breakfast in Morro Bay. This offer is subject to change without notice and based on availability. It cannot be combined with any other offers and is valid January 16, 2018-April 1, 2018. La Serena Inn: Web-Special: Book online or call-in and mention the “web special” for 20% off. Masterpiece Hotel: Web-Special: Book online or call-in and mention the “web special” for 20% off. Best Western San Marcos Inn: Call-in and mention the “web special” for 20% off. Bayfront Inn: Stay 2 consecutive nights and receive 25% off weekdays (Sunday through Thursday) and receive 13% off weekends (Friday and Saturday). All guests also receive a daily continental breakfast, freshly baked cinnamon buns from Frankie & Lola’s Front Street Cafe, bottled waters, juice packs, & snacks, and (2) vouchers for 25% off 1 hour massage at Awaken Harmony. Pleasant Inn: Starting now through March, receive 20% off of 2-night stays Sunday through Thursday. Fireside Inn: Book direct for a discounted rate. Ascot Inn at the Rock: Stay 2 nights, get 20% off the second night on weekdays (Sunday through Thursday). Excludes holidays. Rockview Inn and Suites: Stay 2-nights or more and receive 10% off. Estero Inn: Offering special seasonal rates, starting at $149. Inn at Morro Bay: Check out the lodging special HERE. Harbor House Inn: Low rates starting at $49 per night.